Wizard World is one of the largest comicon/sci-fi conventions held in Central Ohio. Day 2, gave us more cosplay, video game tournaments and Q&A sessions with some great celebrities. 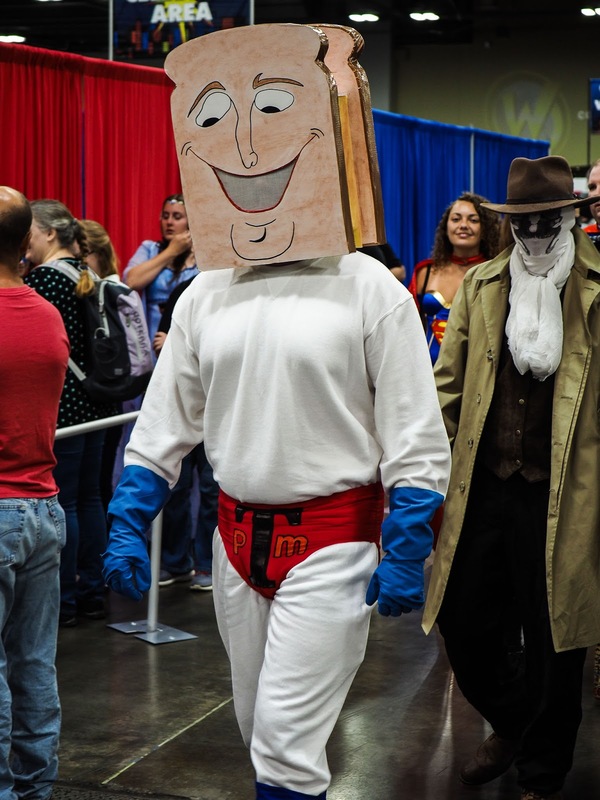 Cosplay was amped up a notch on Saturday. In both quality and quantity, the creative minds of the fans continued to give you a lot to view! Celebrity Q&A sessions were in full force as well. We got to see David Tennant (Doctor Who, Broadchurch), Catherine Tate(The Catherine Tate Show, Doctor Who, The Office - US) and John Barrowman(Doctor Who, Torchwood, Arrow). David Tennant answered a question about his interest in helping people with mental illness. 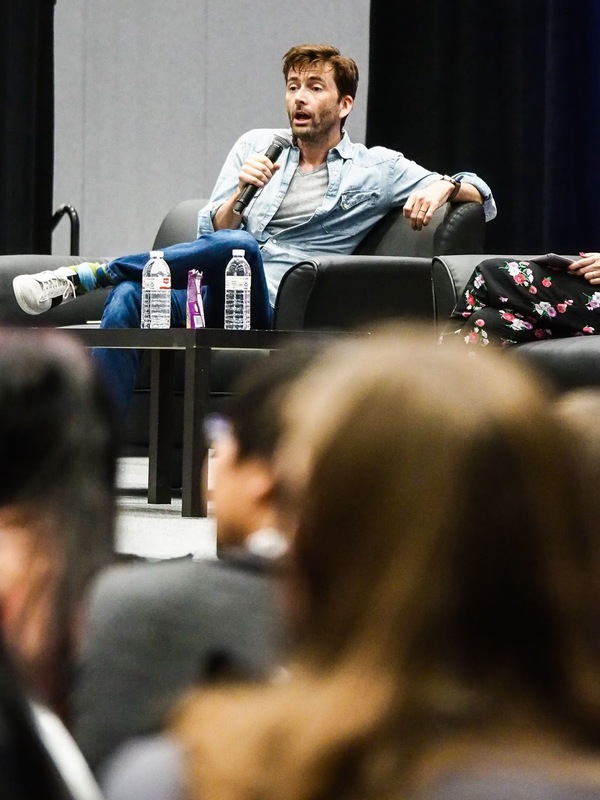 David Tennant provided a humor and seriousness in his Q&A. He was very personable and relatable. Catherine Tate loved hearing all the questions about her diverse career. 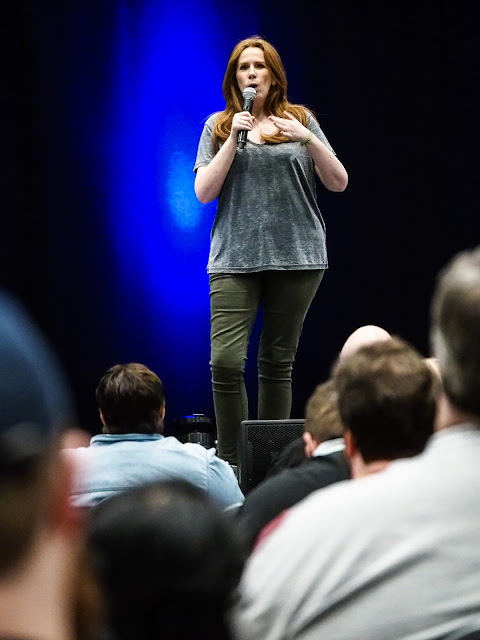 Catherine Tate started out her TV career on a comedy show, so it was no surprise that she brought a good sense of humor and a light hearted touch to the discussions. At the beginning of the show, one VIP section was empty, so she invited everyone from the back of the ballroom to come to the front and fill the section. 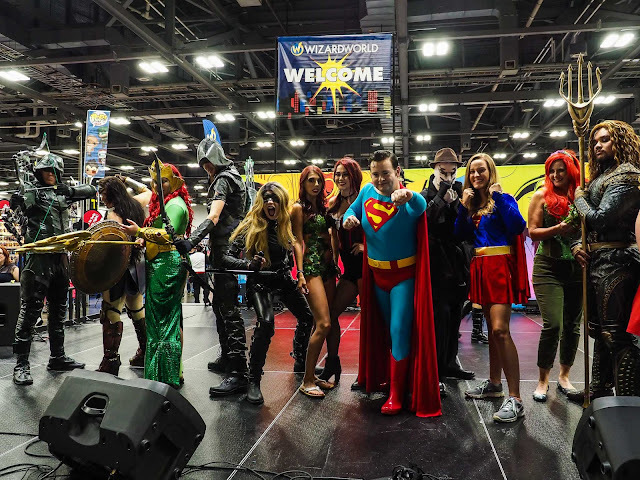 Just a few weeks after an appendectomy, John Barrowman told some great stories, answered questions and even capped off the Q&A session with a song, "I Am Who I Am"
More cosplayers than you can count! 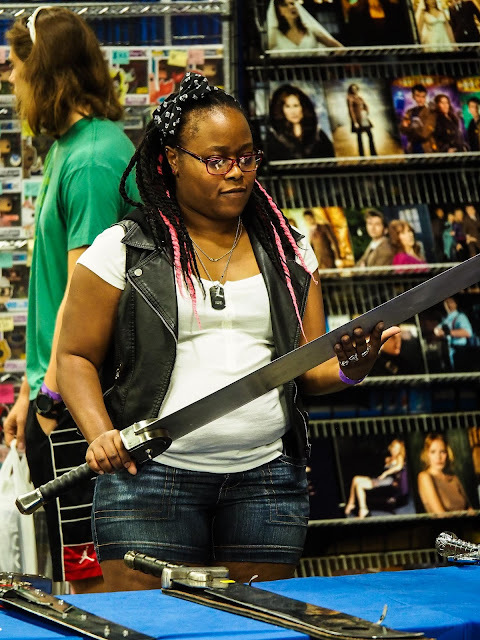 The dedication not only to crafting the costumes, but to the character immersion is just a sight to be experienced! While some are professional cosplayers, there are many aficionados out there that put in a lot of effort and in my estimation, there work is just as good as the pros! 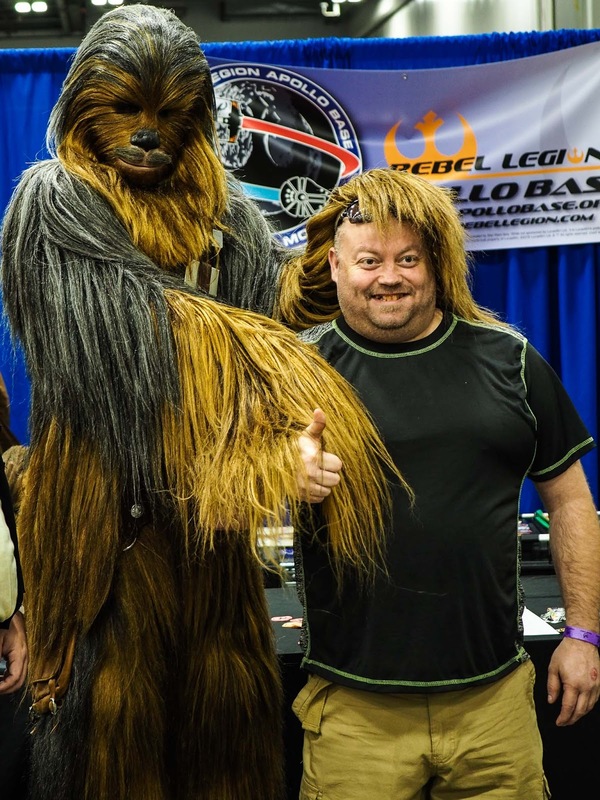 Chewbacca shows some love to a folically challenged fan. 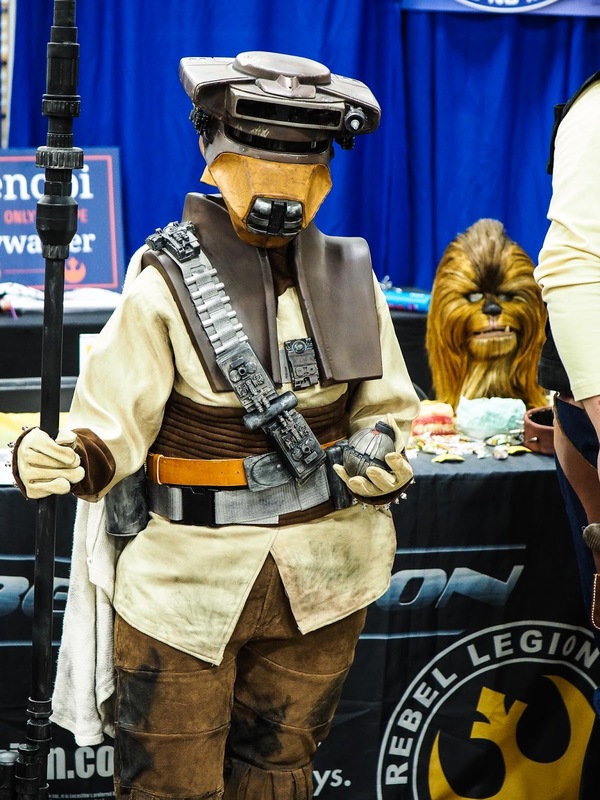 Boushh the bounty hunter even showed up. Wonder who the bounty is for? Powdered Toast Man of Ren and Stimpy fame. 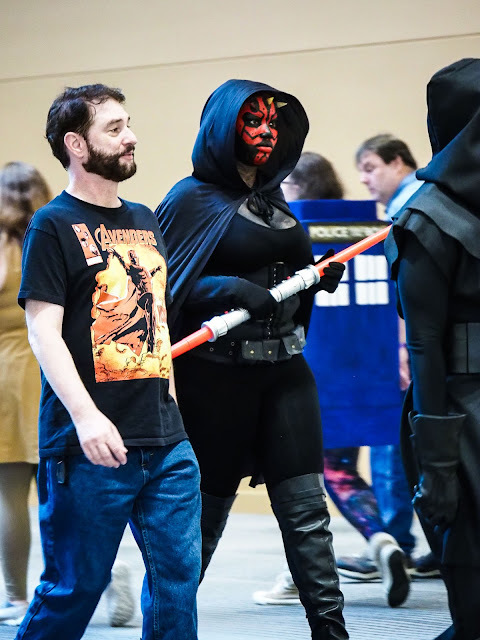 Dathomirian Zabrak female Sith Lord makes her way to the comicon entrance. 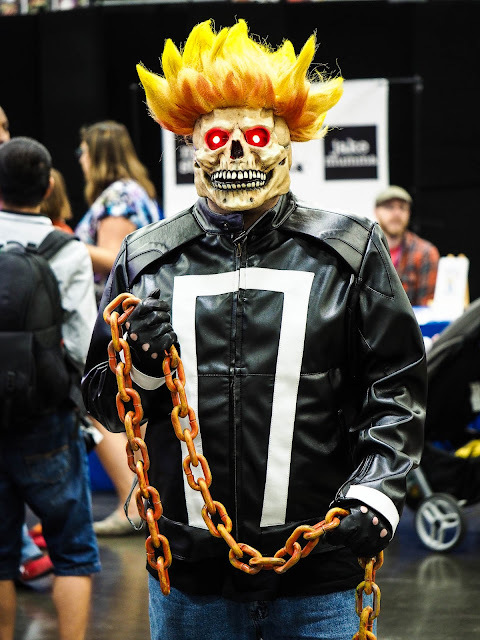 I think that Ghost Rider was looking for his motorcycle!! 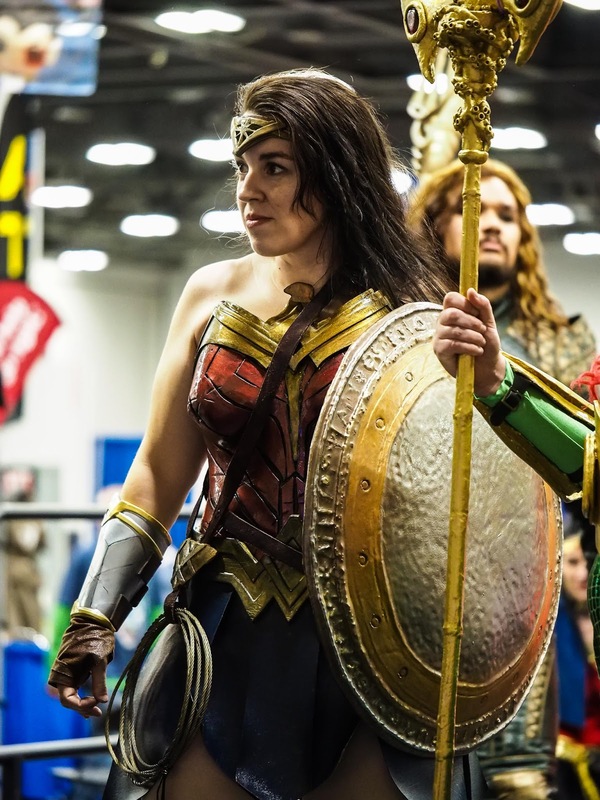 Wonder Woman stares down someone in the crowd. 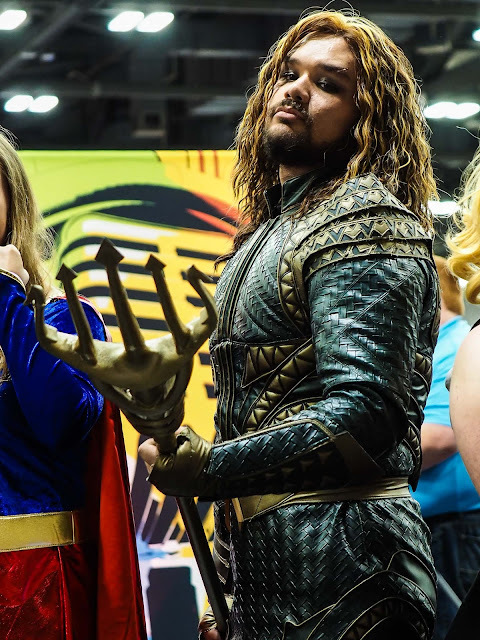 Aquaman, even though far away from his home in the water, looks confident that he can take on any foe that comes his way. 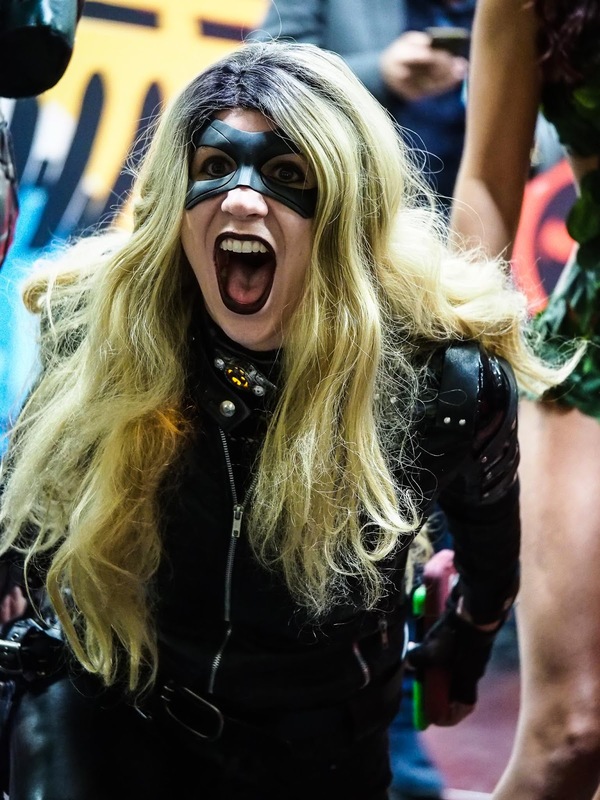 The shreek of the Black Canary!! 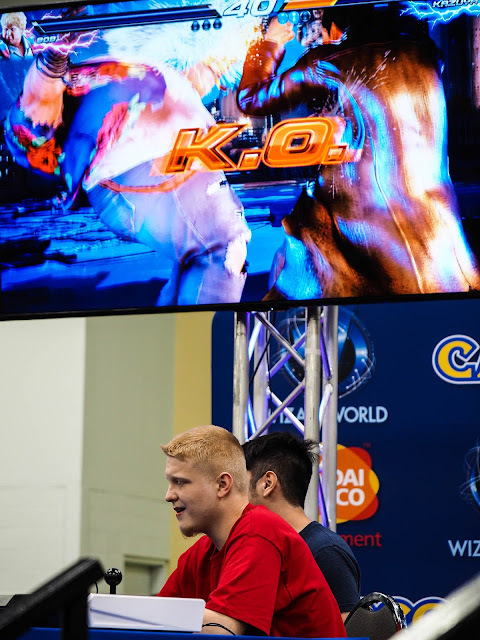 Dadrkman comes out of hiding and sits for a minute to see who is winning the Tekken 7 tournament. 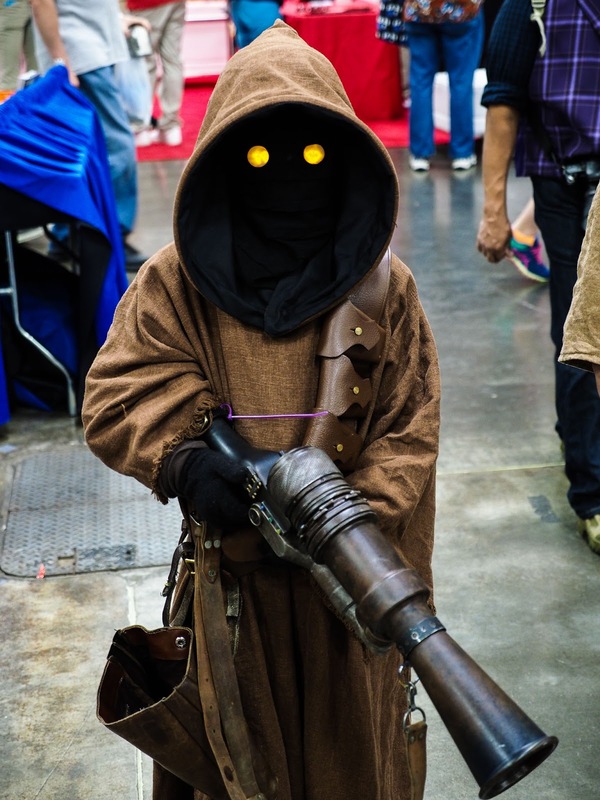 A Jawa was wondering the comicon floor, looking for unattended droids to capture and sell on Tatooine. 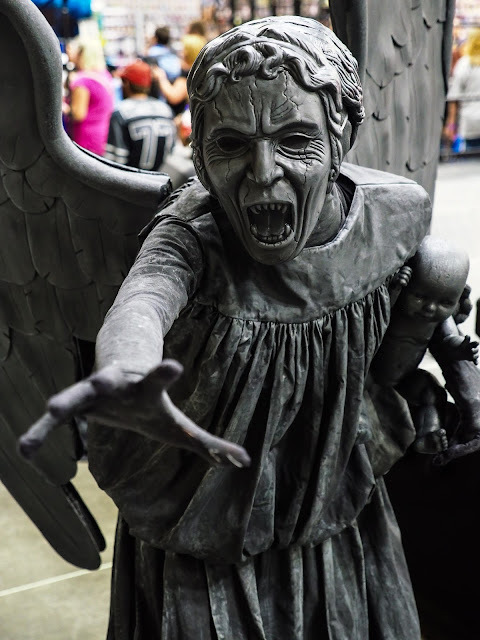 A Weeping Angel from Doctor Who tried to garb me. Luckily, I was able to keep my eye on it long enough to escape through the convention center doors. 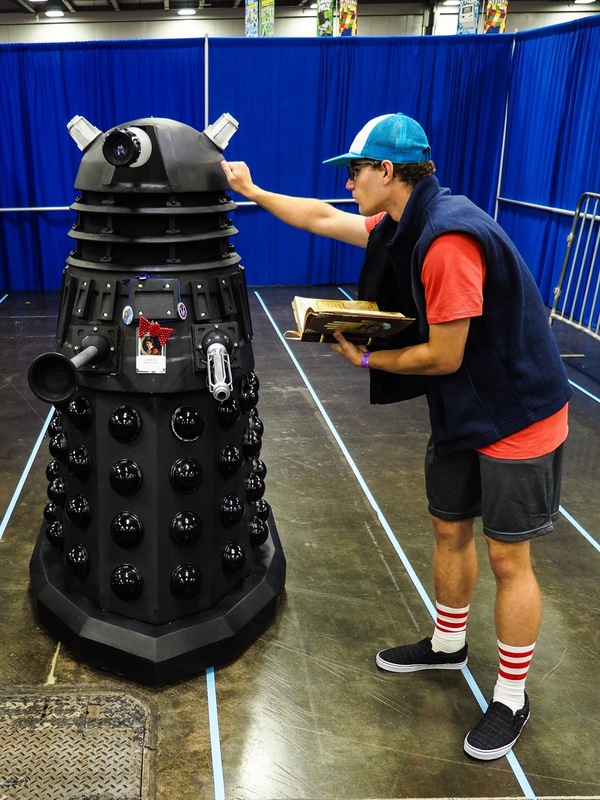 A curious convention goer gets up close and personal with a Dalek Sek. 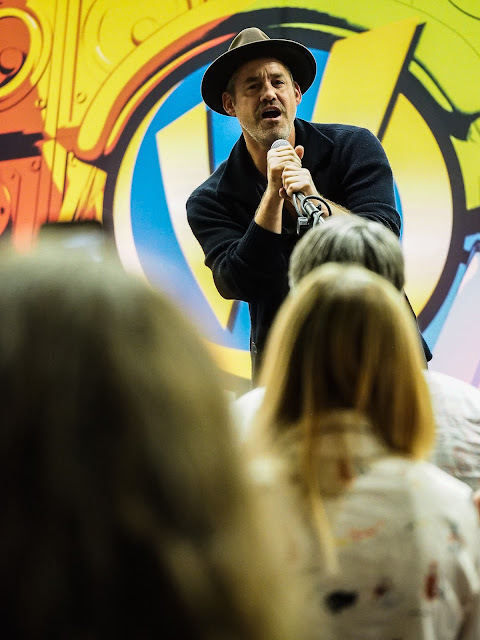 Nicholan Brendon (Buffy The Vampire Slayer) even stopped by the Entertainment Stage and sang karaoke with some fans. Even the celebrities got in on the karaoke fun! Wizard Video Gaming also returned. This day featured fighting games such as Tekken and Street Fighter. 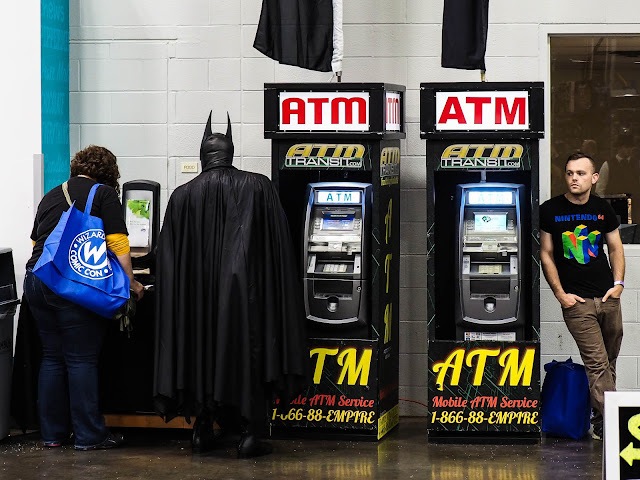 Even Batman should have a little cash on him! Pondering a sword purchase from one of the many vendors. 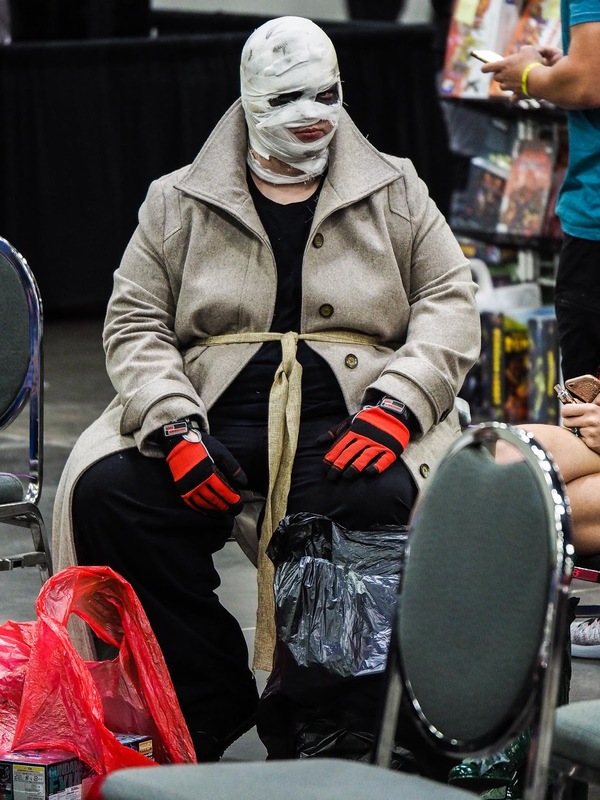 Day 2 was the more intense day....more people, more cosplayers, more energy, just more of everything, really. To be honest if you can make every day of the three you should as their is a great experience to be had by everyone on each day. If you can only make one day, then Saturday will be your best bet on being able to get a little bit of everything.